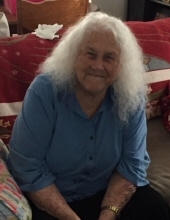 Mrs. Anna (Ruth) Brown, age 89, of Richlands, VA passed away Wednesday October 3, 2018 in a Richlands, VA hospital. Born in Doran, VA she was the daughter of the late Brack & Beulah Monk Herndon. In addition to her parents she was preceded in death by her husband of 57 years John William Brown, Jr.; four brothers and four grandsons. Mrs. Brown was a long time member of the Bible Way Church at Raven, VA. She was a prayer warrior and enjoyed going to yard sales and taking car rides in the country with her family. She was a loving mother, sister, grandmother, great grandmother and great great grandmother. She will be missed by all of her family, church family, friends and neighbors. Mrs. Brown is survived by 10 children: Les Brown & wife Ruby of Tazewell, VA; Ira Brown of Pounding Mill, VA; Margaret Dye & husband Danny of Statesville, NC; Allen Brown & wife Jamie of Raven, VA; Jane Russell & husband Aaron of Tazewell, VA; Sharon Absher & husband Joe of Richlands, VA; Sandra Mullins & her son Ben Stallard of Cedar Bluff, VA; Beverly Webb of Doran, VA; Pat Pyatte & husband Tim of Valdese, NC and Eve Keen & husband Sporty of Richlands, VA; one loving sister Frances Plaster of Richlands, VA; 28 grandchildren, 50 great grandchildren, 2 great great grandchildren, many nieces, nephews, friends and neighbors also survive. Singleton Funeral Service is serving the Brown Family. To send flowers or a remembrance gift to the family of Anna (Ruth) Brown, please visit our Tribute Store. "Email Address" would like to share the life celebration of Anna (Ruth) Brown. Click on the "link" to go to share a favorite memory or leave a condolence message for the family.